This post on Avoid Holiday Stress With These Tips & Marie Callender’s Pot Pies and #PotPiePlease shop has been compensated by #CollectiveBias, Inc. and its advertiser. All opinions are mine alone. Really there is just no way to avoid holiday stress and everything that the holiday season can bring. With Christmas concerts, Christmas parties at school and various organizations we belong to, Christmas shopping, baking, decorating and not to mention the kids are out of school for an extended amount of time, all while we are cramming in tons of extra responsibilities. It’s easy for things to get out of hand and the pressure to build till we are ready to explode. It’s times like this when I am thankful for Marie Callender’s Pot Pies and the following tips to help me get through a stressful season with as little holiday stress as possible. I belong to a freezer swap group and last month when we swapped I made a couple extras of the meal that I was sharing. Not only did I make a couple extras but we didn’t eat any of the meals that I received in exchange for my swap last month. This meant that my freezer was packed with a nice variety of meals that would be ready with little to no work. One of the biggest things that stresses me out of Christmas is the cost of everything! Like I say in the last one on this, not buying for everybody has helped out a lot but I still need to keep in mind that not everyone needs $100 gift, nor do my kids need to have more than a couple needed gifts a piece. My husband and I set a budget of what we are willing to spend this year and we have tried to stick with it. We vaguely said what we would spend on each other, parents, in-laws and brothers. We then left the remainder of the budget to be on friends and business associates. At times this has caused me to get a bit creative which is a good things for more than one reason. Ok, so my freezer meal swap group isn’t that big and can’t cover the whole month without a little further planning than I did. Thus we have been eating more easy convenience meals from the frozen section than usual and it’s truly been a help. Recently through my partnership with #CollectiveBias I found out that Marie Callender has introduced their new Marie Callender Pot Pies in a Family Size available at Walmart. I will say they have been a dream to have on hand at all times in the freezer! Marie Callender is a brand that I know I can trust to provide my family with good wholesome meals with no prep work from me. I can start our evening routine with the boys and 90 minutes later we are eating a delicious pot pie dinner that tastes completely homemade! Can I have another #PotPiePlease? 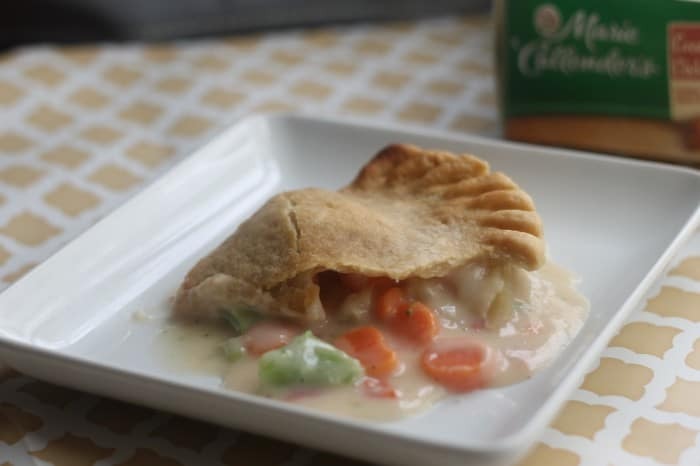 Find some awesome meal pairings for the Marie Callender Chicken Pot Pies by visiting Pot Pie Please and find more information on the Marie Callender facebook page. As I said above many of the functions I attend require a cookie exchange. 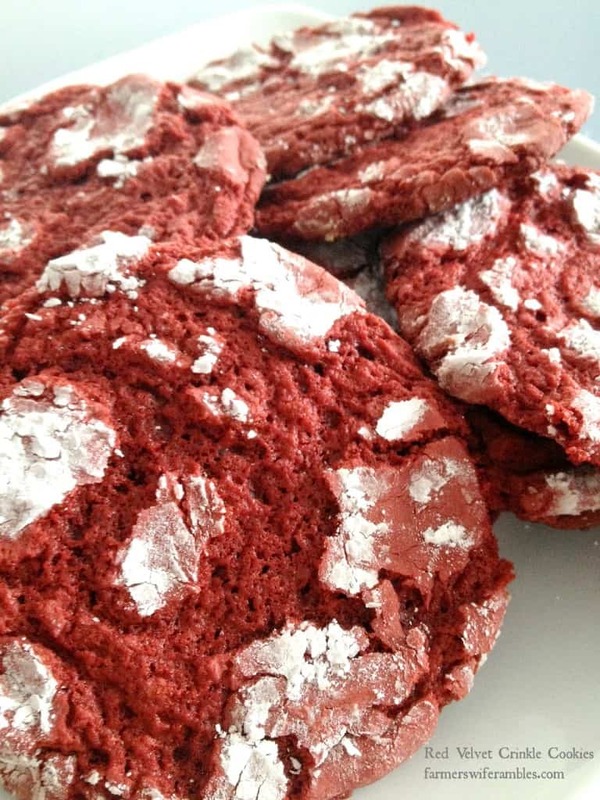 Luckily for me a lot of these groups don’t share a lot of the same people so that I can find one cookie recipe that I know freezes well like these 4 ingredient peanut butter cookies or these red velvet crinkle cookies and make up a huge batch of them at one time. I spend one very long day in the kitchen before the stress of the holiday season hits and I’m done. Not only am I ready to go for my cookie exchanges but cookies for Santa are made! I also do some prep work for our holiday meals that I know I will be serving so that I don’t have to be stressed Christmas morning. I freeze things like my rolls and cheesy hashbrown casserole ahead of time so that is two things I can mark off my list. They just need a spot in the oven to be cooked. I LOVE LOVE LOVE entertaining and but I can quickly get out of hand in thinking that it needs to be the festive party of the year. 15 appetizers and a 7 course meal with 5 dessert choices adds a lot of stress to the evening. Keeping these entertainment commitments simple has also been a a huge holiday stress reliever. I’m not just talking about hosting either. I have turned down a few commitments this year because I just can’t make them all for various reasons. I don’t have the energy this year to bounce from party to party nor the energy to keep up with those parties demands. Many of them require a cookie exchange, gift exchange or an ornament exchange. Not only are they time consuming (although fun!) but they hit hard on the pocket book. I am so guilty of thinking I have to purchase a gift for everyone I know. This year I trimmed my list down by over half and and I can really see a difference in my holiday stress level. Many of my friends I knew were stressing about the same thing. Not only can it get expensive to purchase for whole families of childhood friends but sometimes it can be tough to know what to get each member of the family. This year we all decided we would only buy for each other. No kids and no husbands. What a relieve this has truly been! 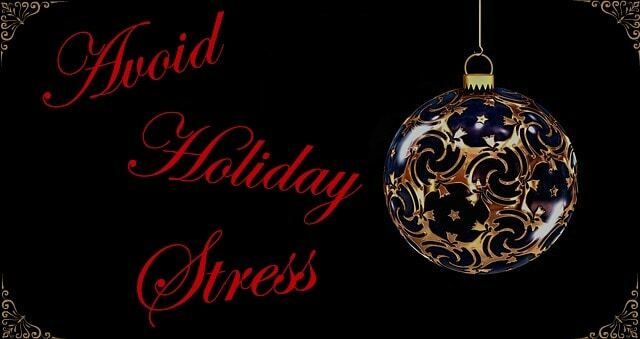 This holiday season I beg you not get so stressed. 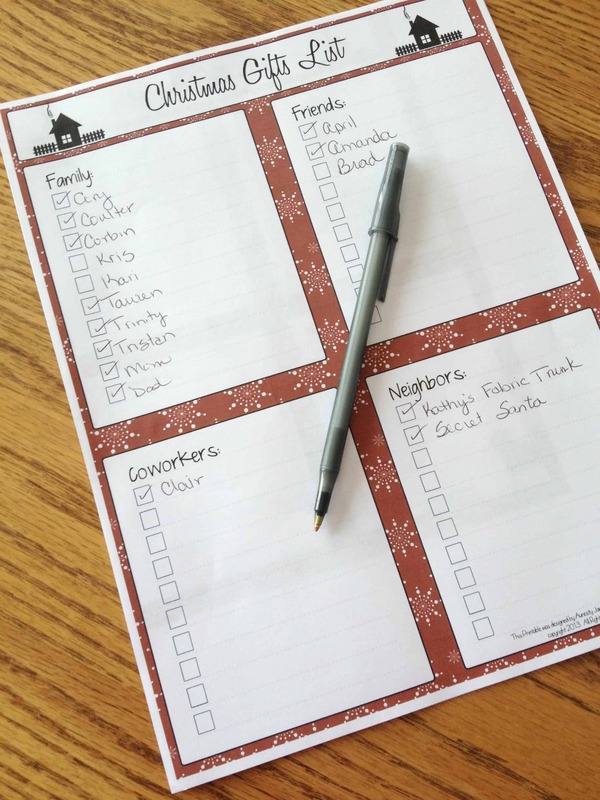 Little steps help out in a big way which only leads to a more fulfilling holiday season. 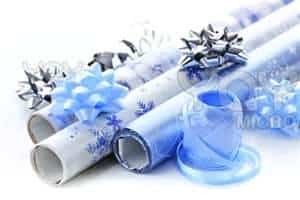 When we keep the holiday stress over money, time and family to minimum we are able to focus more readily on the things that this season is truly about. How will you be keeping your holiday stress to a minimum this year? Do you keep things laid back or tend to over book yourself? Keeping a budget is a great tip. That’s one that I could be better at. I absolutely love pot pies! They make an amazing meal on a cold night. Great for the busy holiday season. We just had a pot pie for dinner last night! Marie’s is the only brand that everyone in the family will eat. Great list! 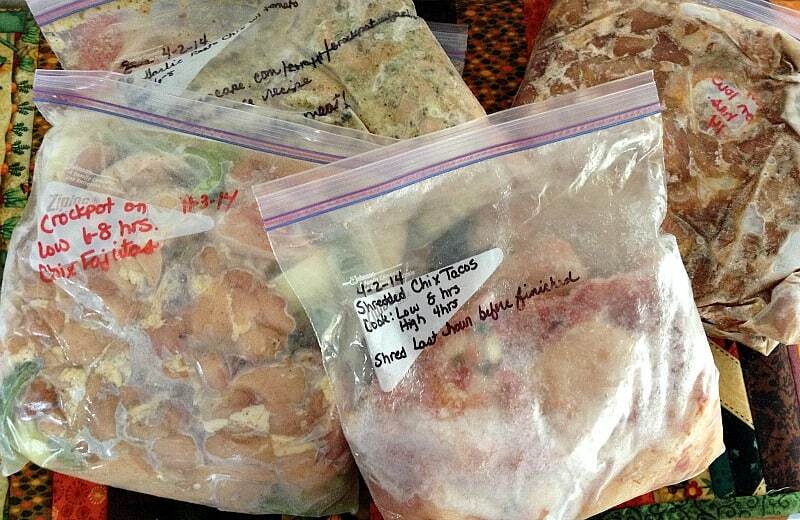 I would love to get involved in a freezer cooking group! Sounds awesome! I also love that Marie Callender has FAMILY SIZE pot pies now!!!! I love their pot pies and this will save me so much time this month with everything else going on!